On the death of her own mother, my Mother, Muriel , 7 months old, was "given" to Elizabeth Ann Wignall, her mother's cousin to raise as her own child. On my grandmother's death, her family papers and photographs were left to my mother and passed to me. 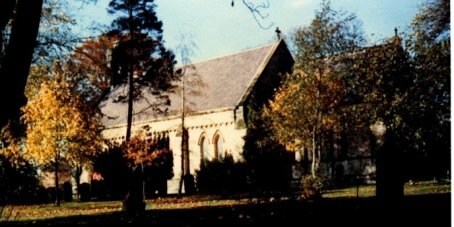 James Wignall and Elizabeth Ann Gilhespy were married on 9th July 1898 at Shadforth Parish Church. He was a local methodist local preacher. Their mothers were Elizabeth and Emily Smith, sisters making them full cousins. Elizabeth Ann gave her father's name as William Gilhespy and his occupation as shipwright. As her mother was already a widow in the 1881 census, I have been unable to check this. I am unable to find Emily on the 1891 census. Her children, Elizabeth Ann, Joseph and George are all living with there aunt, Emily remarried and died in Morpeth. James and Elizabeth Ann had several children. All other children died in infancy. 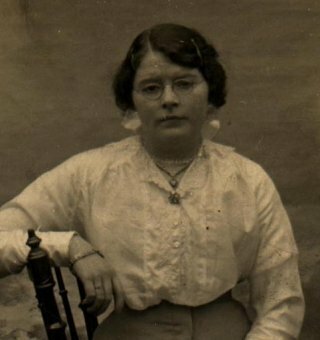 This is a photograph of Emily in her teens. Like her brother, she suffered from consumption and had just returned from a stay at a sanatorium. She died in 1918. I found this post card, sent by Emily to her cousin, Esther Harker, in 1909. It is Emily with her school class although I do not know which girl she is. 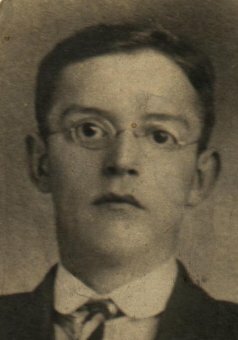 James Wignall died from influenza in February 1919, during the pandemic of that winter. 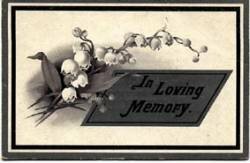 This mourning card is with their marriage certificate. 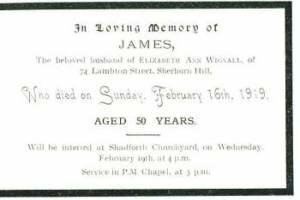 James Wignall was a local preacher in the Wesleyan Chapel. He worked as a miner and was very active in the mineworkers union. He helped to form the Sherburn Hill Cooperative Society and was their first president. He helped rise funding for a group of houses built to house aged miners. From 1921 to 1943 Lizzie Ann Wignall (as she was usually known) lived in various properties in Sherburn Hill. They kept a shop to eke out their saving until money owed to them made this no longer viable. 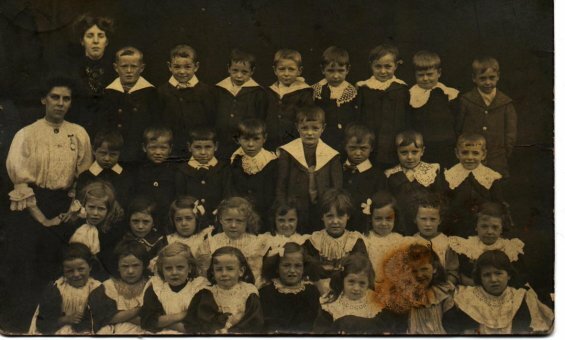 Lizzie Ann then became caretaker at the local school while mother used her dressmaking abilities to help financially until the Widow's pension was introduced by Lloyd George. 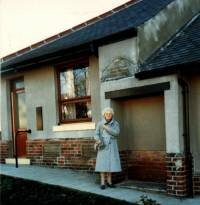 I was born in her house in Local Avenue and spent many happy hours there until her death in 1948.